Daniel has run one of London’s leading interior design companies, Studio Hopwood, for twenty years, working on high end residential properties. 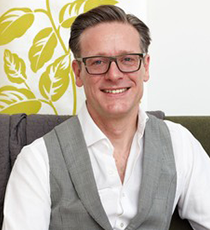 His knowledge and experience has been recognised by the industry by being elected the next president of the British Institute of Interior Design. After graduating with a degree in architecture, he joined the Prince of Wales Institute of Architecture where he gained classical training. While Daniel specialises in contemporary design, he does so with a deep understanding of the provenance of a building. His work is featured in publications worldwide, as well as at home, and Daniel is often invited to write articles about design for the British Press. He tutors at a leading design school in London and is invited to share his specialised knowledge with a bit of humour too at trade show lectures. Daniel is a great believer that good design should not be exclusive, but instead should be made accessible to all. He presented and judged the Channel 4 series, Britain’s Best Homes and has now followed that up by working alongside Sophie Robinson and Tom Dyckhoff in the The Great Interior Design Challenge for BBC2.